As an authenticator, scams, frauds and phony stories are all part of the typical day. There is what you “know” and what you can “prove.” The former often outweighs the latter, so it is a refreshing break when a situation presents itself that undeniably proves the scam. Here is a John Glenn signed postal cover that was authenticated in January of 2019 — more than two years after John Glenn’s death. The signature is authentic… no doubt about that. Yet, two months after authentication, the same signed postal cover appeared on eBay with a typed note on it. The note was supposedly written by John Glenn and provided provenance to a flown flag. John Glenn could not have added the typed note two years after he passed away, so the provenance is obviously fabricated. This is an example of trying to turn a $75 signed postal cover into a $1,800 Buy It Now flown flag. Even if I did not have the “before” photo, this is a fairly transparent scam. The poorly written typed note with the bizarre “with much love” closing is completely uncharacteristic of John Glenn. And why would Glenn use an unrelated postal cover with a stamp from 1971 to thank a NASA worker for something that happened in 1962? The whole thing is an amateur, clumsy hoax, but it’s nice to be able to “prove” it. The lesson here is that an authentic signature does not necessarily assure an item is truly flown or celebrity owned. With the escalation of the value of flown items, this will only become more commonplace and sophisticated. You need to stay a step ahead of the fakes, phonies and frauds. As always, use common sense, look at the whole picture, and caveat emptor! Have a happy & healthy 2019! 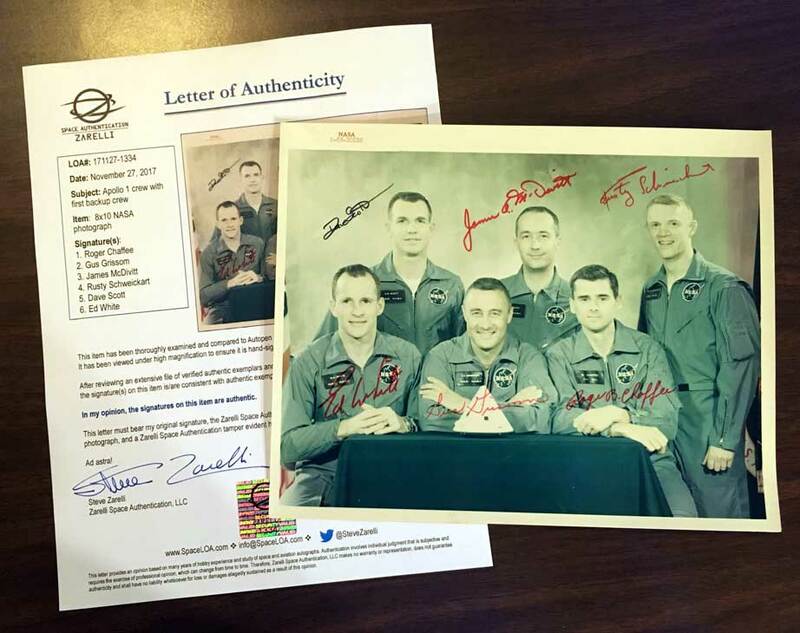 Here is an exceeding rare item — a signed NASA photograph of the Apollo 1 crew with backup crew. It is the first and only example I have ever seen. Every year I look forward to the USAF Band Holiday Flash Mob video, but they didn't do one this year. This is a pretty good one from The Five Strings. Enjoy! Would you believe that both Apollo 17 signed mats are the same Autopen patterns? Look at the variation in the G in Gene, the R in Ron and the E in Evans! I suspect the Autopen arm was bouncing around due to the bumpy surface of the mats. There can be a great deal of variation in the same Autopen templates due to the armature vibration, the item being pushed through too quickly, the template wearing out, etc. Often, some people will claim an item is NOT an Autopen because there is a tiny variance from a published pattern, even though the remaining 98% of the signature is a total match. Don’t believe them! With practice and a sharp eye you can identify Autopens that vary from published patterns. If you are not sure, I can help! Thank you for your support, business and friendship! I look forward to continue serving the community in 2018 by helping collectors build treasured collections of authentic material. 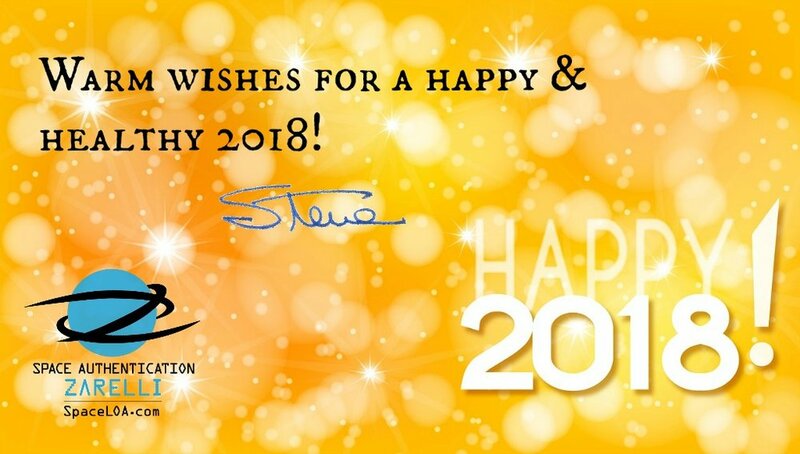 May 2018 be a great year for your collection... the best is yet to come!